I love Taco Bell. I mean I really love Taco Bell. Unfortunately, this eating healthy and working out thing GB and I have going on right now prohibits the Taco Bell consumption. I was, once again, perusing on Pinterest, and found the next best thing: A healthy version of a Crunch Wrap Supreme from Hungry Girl. The Crunch Wrap Supreme is one of my all time favorites from Taco Bell so an imitation is exactly what I needed. I took their idea and changed it up to suite our tastes. The girls over at Hungry Girl used a frozen, meatless soy based crumble for their protein. I'm not really into meat-like substances, so I went with ground turkey and added taco seasoning. While that was cooking, I prepared the veggies. Following Hungry Girl's instructions, I warmed up the tortilla in the microwave for a few seconds. Next, I added the internal ingredients. Then I folded the tortilla like a champ! Sometimes, champs need toothpicks to hold their tortilla's together, so what? After coating the pan with olive oil based non-stick spray, I supremely grilled that crunch wrap. 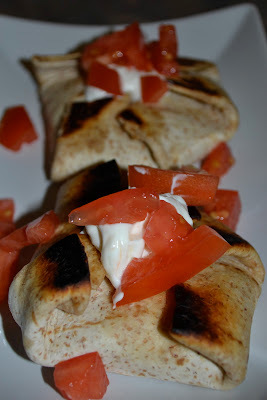 The wraps were crispy, maybe a little burnt, after a few minutes on the pan. Lucky for me, GB likes things a little burnt, or so he says. No crunch wrap is supreme without sour cream and tomatoes. Did my crunch wraps compare to Taco Bell? GB believes they are better and I loved them! The added fresh vegetables and avocado were an awesome addition. I didn't feel guilty for consuming ground turkey! I know there are some intense Taco Bell lovers out there - would you be willing to give this a try?